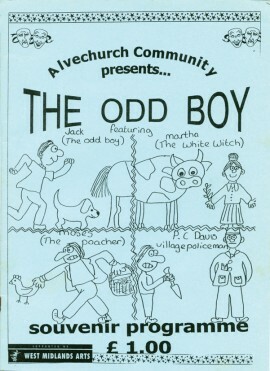 Richard Peach remembers The Odd Boy community play. The Odd Boy takes me back to a summer 16 years ago when friends in Alvechurch, who had never even thought of treading the boards, found themselves acting in front of hundreds of people for four nights in a row. The characters, including Martha Harber, were from village history 100 years earlier and the story was written, with the help of professional director Richard Hayhow, by local people. It followed events surrounding the murder of PC James Davies (played with spirit by Dave Hodgins, now better known for fixing cars at Appletree Garage) in Weatheroak and was staged in a barn at Rowney Green owned by Roger Hollingworth, many years before he was swept up by local politics. Roger stepped in to help when no other venue large enough could be found. His barn, occupied by sheep until shortly before the performances, needed more than sweeping and a pressure washer did the trick. Most of the audience took their own seating to the barn and were rewarded with an evening described by a local paper (this was three months before the first issue of The Village – creative times!) as a “warm and entertaining vista of village life” featuring a cast of 50. It was a real community effort that spawned many other activities, with its energy. Bromsgrove District Council has probably not spent a better £4,500 since. See also Martha’s Village Life.